Edward (the vampire) leaves causing Bella (the human) to go into a frantic depression and isolation. She wakes up in the middle of the night screaming with nightmares. This concerning her father, tried to make her live with her mother. Soon after Bella gets out of her depression a little, she realizes the only way to see Edward is to cause near-death experiences. Causing her to go to a group of men with motorcycles who remind her of her previous assault, jump off a cliff, as well as other thrill-seeking activities. Bella always sees Edward before doing the foolish things. This version of Edward tells her to stop but she refuses to listen. She learns the only way to see Edward is to do these things so she continues. When your love leaves, it is normal to go into some sort of depression. That part I know and understand. The problem I have is with the suicidal issues. The movie is basically telling teens and young adults that it is ok to do something dangerous when a loved one leaves. Love can cause a person to do foolish things, this I know. I just don't think it should be said in a movie. Edward eventually comes back after thinking Bella killed herself. 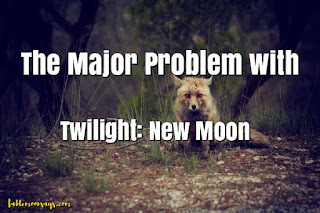 Yeah I know this post is short but it has just been bothering me especially with the news that Twilight is coming back in theaters for the 10year release date. That's some very good points you're making there! I didn't like the twilight movies either but watched them with the teens I work with. I was also very concerned because Bella is portrayed as a "weak little girl" and I have talked to the girls about it on several occasions so they wouldn't think it's right or normal to find validation only through their boyfriends. I am glad no one of those girls would do that. It does seem like the whole movie she relies on Edward way too much. I don't care for these books either. I don't think I'm the demographic they are written for either. If I had to choose it wouldn't have been Edward either, lol.